A little over 6 years ago, Craig’s LA opened its doors in the West Hollywood Design District. Craig’s made a splash back then, and the restaurant is just as notable today. The question beckons, what keeps patrons coming back? We recently caught up with Craig Susser, and gained an inside look on his background, inspirations, and the ethos behind his business, which has contributed to his success. What was your favorite homemade meal growing up? It is easier for me to remember the things I didn’t like – liver, most vegetables and tomatoes. I hated tomatoes until I was 15 but liked tomato sauce, go figure. I remember liking chicken parmigiana, meatloaf and mac and cheese. I’ve learned that you used to wait tables when you were in college, when did you realize you wanted to continue to work in the restaurant industry? I would have to say when I took over as Maître D at Dan Tana’s was when I thought this might be my calling. I can’t tell you why – but I knew I was good at it, I could see the room and all the chaos and instinctually knew how to make it work. When did you fall in love with the restaurant industry? I am not sure when I feel in love with the restaurant business, but I do know I am a lucky person because I get to do something that never really feels like work – I love my work. It’s an incredibly difficult business so you better love it and enjoy the process, otherwise you will go crazy. There is nothing better than walking through the restaurant at about 8pm and feeling the energy in the room. It feel as if the room is alive! What drew you into opening your own restaurant in the West Hollywood Design District? The West Hollywood Design District is the perfect location for a restaurant in Los Angeles. The diverse nature of the people, the wide array of different and creative businesses (art, furniture design, fashion and food) and the fact that the District is perfectly situated at the base of the Hollywood hills right in the middle of the Pacific and Downtown. Craig’s is really an American Restaurant. The menu has influences from many regions and cultures of the world. Latin, Italian and underneath is a great deal of traditional French techniques. 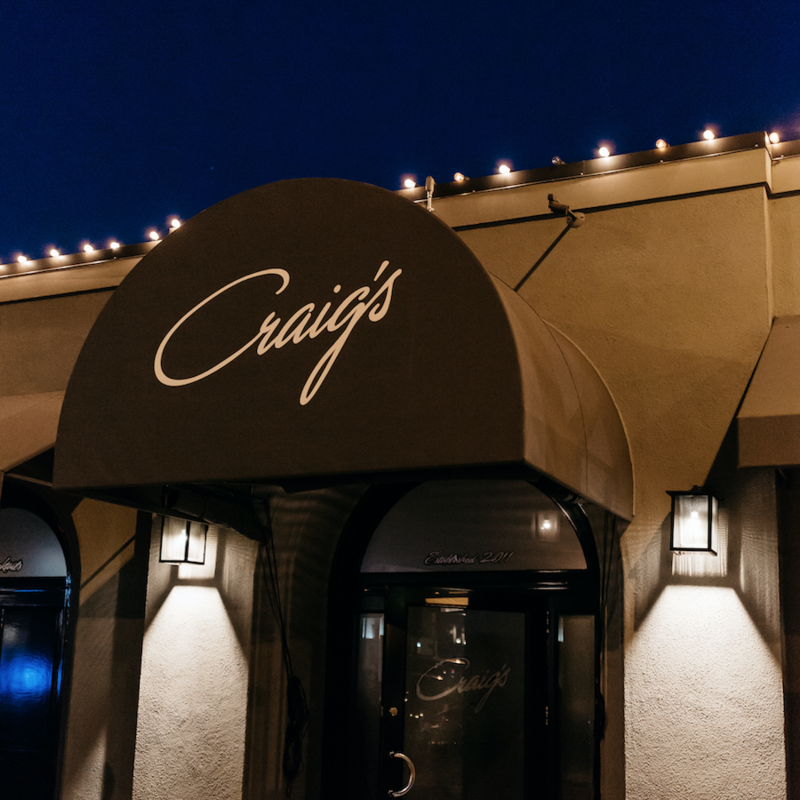 I worked very closely with our chef Kursten Kizer to have a varied menu so that whatever you were in the mood for, you could find it at Craig’s. Most importantly, we wanted the food to be accessible. What are your biggest inspirations behind Craig’s? The most influential inspirations are the classic old-school New York Restaurants. We kept asking ourselves, if a famous 1940’s restaurant was reinvented in 2011, what would it look like? However, we had to balance that concept with how we eat today. Why did you decide to incorporate vegan options into your menu? The decision was simple, really: our regulars started to request vegan options. We are in the hospitality business, and I want to give our clients what they want. I also want to see them as often as possible. We started out making one composed vegan dish, not your average plate of vegetables but a well thought out dish. People would walk by as someone was eating it, and they would ask what the food was and if they could have it as well. One dish became 2, and so on. What inspired the new vegan ice cream option on your menu? Again, the inspiration came from the desire of our customers. There was nothing on the market we were excited about, so we decided to make something exciting ourselves. It’s a collaborative creation from myself and Chef Kizer. We are now working on making the ice cream available for sale as a standalone product called “Craig’s’ Vegan,” which will be available online and in select markets. What will always put a smile on your face when opening your doors each day? Every day that I have the opportunity to open the doors of Craig’s puts a smile on my face. I never take for granted the amazing gift of having a restaurant people call home. What story do you want to tell at Craig’s? Our mission has never varied. I wanted to create a warm inviting restaurant, with great, accessible food, an accommodating and diverse menu for all appetites and a gracious floor staff. Furthermore, we want to keep evolving our sense of food and hospitality to match the desires of our clients.